Prince’s hosted the Open Championship on one occasion. The winner, Gene Sarazen, only claimed one Open title, but “The Squire” was the first golfer to win all four Majors. It was difficult to decide exactly where to rank Prince’s Golf Club because there are 27 holes in three loops of nine, named Himalayas, Dunes and Shore. We've since made our minds up and agree the Shore & Dunes loops form the best 18-hole combination, but only just. Recently we've added a new independent webpage for the Himalayas so we don't do any of the three circuits a disservice. At the turn of the 19th century, it was decided that a new links should be built at Sandwich, next door to Royal St George's. The new Prince's Golf Club would welcome ladies, juniors and men. Charles Hutchings and Percy Lucas laid out the course on land donated by the Earl of Guildford. The 18-hole course, stretching out to almost 7,000 yards, opened for play in 1907. The military commandeered the course during both World Wars; it was virtually obliterated during the Second World War. However, in 1932, Prince’s Golf Club proudly hosted its first and only Open Championship. “The Squire”, Gene Sarazen, was the eventual winner. Sarazen continued his winning streak, becoming the first player to win all four Majors. Sir Guy Campbell and John Morrison were commissioned to re-build Prince’s after the devastation of the Second World War and, incredibly, they were able to save 17 of the original greens and incorporate them into the new 27-hole layout. They have created a classic “links and a half”, with raised greens, rippled fairways, deep bunkers and, naturally, that famous links rough. The Dunes and Shore loops make up the “championship” course. The Himalayas is shorter but nonetheless, an enjoyable nine holes. Above all, a warm welcome awaits everyone, much as it did it when Prince’s Golf Club first opened, over a hundred years ago. Any of the 3 combinations of courses make for a quality 18. It’s a welcoming, friendly clubhouse (walking from the hotel a staff member offered me a lift) with history displayed and a decent pro shop. The winter practice ground and mats though are dreadful, especially at £4 for 30 balls. If the grass range is closed, just use the nets to warm up. Shore + Dunes was my favourite of the three combinations. You know what you’re getting when you play Prince’s really, and it didn’t disappoint. I prefer the Shore as you get that sea smell, you play up to the old 18th where Sarazen won, plus I found it a little easier (reputation says it’s harder). Dunes has a few more greens perched on hills, is a bit shorter and has I think more intimidating bunkering. Both are great nines. My main problem though with Prince’s is queueing for your second nine. There’s no guidance on the scorecard, on the tees, no etiquette (some people were rude & demanding) and where large groups book you can get stuck for 30+ minutes. So I’m glad I visited (amazing overnight value) and I’ll go again but I hope there’s more of a system in place for high season. Despite playing in the rain for 20 of the 27 holes this past weekend, I absolutely love the three loops here. They are such a fantastic mix of holes that you never really get bored of the course! I need to start with the drive to the clubhouse, driving past Royal Cinque Ports and then right by Royal St. George’s only gets you even more excited for whats to come and especially knowing you have 27 holes coming instead of 18! We played the newly renovated Himalayas, then the Shore, and then finally the Dunes. The first thing I noticed about the first hole on the Himalayas was trees! I was surprised to see trees and this instantly reminded me of Formby which too is on the coast but has a few holes with some trees on them. A perfect dogleg right to start the day with a very well hidden pot bunker off the tee in the middle! Its so small from the tee that I initially thought it was a yardage marker! The second hole is a newly converted Par-4 and Par-3 into a sweeping dogleg left Par-5! The landing area is very tight and anything left is lost in a ditch or in a field. The sandy scrapes all over this loop are perfect and I love the fact they have small little sea shells in them that just add to the fact that you are indeed playing on the coast! I won't go into hole by hole detail but I will say that there is a definite penalty on nearly every hole for missing the green on the wrong side. You will often find yourself six to ten feet below the green and sometimes about thirty feet away. Something else I noticed was that this was an incredibly narrow course off the tee; on either side of the fairways you either have natural sandy scrapes, or a brook, or thick fescue. I very much enjoyed this 9 and thought the holes were superb, especially the two Par-5’s, they are both long and have very difficult second shots. The course needs to bed in a tiny bit more to become completely natural but it genuinely seems like the holes have been there for years. On to the Shore loop now and this has a definite links feel for me; bumpy fairways, pot bunkers, and greens just begging for a good ground game. This loop plays in the opposite direction to the Himalayas and some holes are entwined with the Dunes loop so be wary of playing the correct hole next. This loop does not have the beautiful natural sandy scrapes that the Himalayas has but more than makes up for that by having wonderfully placed pot bunkers which in themselves are oddly beautiful against the greens and fairways. I noticed for the first time in a lot of golf rounds that on almost every hole, I had a fairway bunker in play. This is quite rare and must be a part of the courses I play usually around London but it was great to have to stand on each tee and have a mental battle with yourself over which club to take. The Shore nine takes you right to the far end of the Property and takes you to The Lodge and also just shy of Royal St. Georges. It is very peaceful here and you feel like you are away from the bustle of the clubhouse and numerous putting and chipping greens. Again, this loop has a fantastic combination of short and long Par-4’s and some very tricky long Par-4’s. You really need to manage where you miss and it is rare for me to play a course and think like this. Some would argue that it is a negative mentality; where am I going to miss this shot? but in actual fact, it greatly helps your score. Take hole number six for example; long straight hole where the green is kinked slightly to the left but still plays parallel to direction of play. Anything to the right of the green, finds the ball rolling down a steep fall off a good ten feet below the hole where the best shot is either a putt or a chipped 8-iron into the bank. If you aim your second shot to the left, you will roll around the edge of the banked green and stay on the shelf rather than roll down the run off. The same can be said for numerous other holes, especially the Par-3’s. For me though, my favourite 9 was the Dunes. This nine has a few Par-4’s where I could have spent hours just hitting a complete range of second shots into the greens! The fairways are a bit wider off the tee and the green complexes are fantastic. Especially the holes along the boundary and on the corner with Royal St. Georges, they are undulating and play quite long. It felt very peaceful in this area of Prince’s which is probably why I liked it the most. I will say that Prince’s has a fantastic set of Par-3’s amongst a brilliant set of Par-4’s and 5’s. All the holes offer a great mixture of long and short approaches and most of the time you will have an awkward stance. You are not as close to the coast for the majority of holes yet you never lose the sense that you are playing a classic links course. It’s location, right by Deal and Sandwich has its advantages amongst the obvious disadvantage; over shadowed by its neighbours but as a result is quiet and always will surprise you with how excellent it is. We played this over the past weekend as part of the outstanding Winter Golf offer and loved every minute. Our first routing was Shore and then Dunes. The Dunes nine was by far our favourite loop where every hole had a huge amount of variety and character. The tone is set with the opening par 4 that tempts you to cut the corner before an iron or pitch to a hogsback green where you have to land the ball on a sixpence. There are great holes on this nine, with both par fives outstanding (especially the scenic 6th) as well as the two par fours moving away from the clubhouse. The 8th is a really strong par 3 as well, with a green that has lots of borrows and undulations. The Shore 9 was probably the tougher of the two with a nice variety of holes - the par fours in particular are excellent on this loop, with the 9th a particularly iconic hole. The accommodation and other facilities were excellent and for the time of year, the course was in great condition (just a shame that quite a few fairway bunkers were GUR). Simply put though, there just isn't a better value winter golf package than this one and it's well worth the trip. I recently played the Shore & Dunes loop on a cold & wet November day & the weather didn't detract from what is a great test of golf. I'm lucky enough to have played this course several times in the past & to say Princes is the lesser of the 3 on this glorious stretch of golf coast, is to do it an injustice. Playing from the White tees it offers a great test of shotmaking & control of the ball is a must, the course offers birdies to well struck shots & bogeys to those not stuck so well. On my quest to finish playing ALL the Open Rota Courses (past and Present) and now only missing Musselburgh Old I drove 6hrs on Monday July 24th after 7 days at The Open to play this one and the following day I was scheduled a demanding test to play both Royal St George's and Royal Cinque Ports both on the same day. It has nothing to do but it is fair to tell that I had a 6:30am wake up call and a 6hrs drive from Liverpool arriving 1:30pm just ready for a quick lunch and tee off at 2:30pm before staying at the charming Lodge located by 5th green and neighbour to Royal St George´s. I decided to play the "central" course (Shores/Dunes) as it was that one the one who hosted the Open in 1932 won by Eugene Sarazen. It was a tough day, cloudy but no rain and very windy with at least 30km/h in the unusual direction which is downwind 1 to 5. With no warm up and no streching, I just went to the tee joining a father and son who happened to be a great playing group and really enjoyed it. And played great, which usually helps to get a better "memory" of the course, scoring even par from the white tees with not one lost ball and bogeying both front 9 par 5s which is always disappointing. Both loops despite being in the same piece of land are totally different, I would say front 9 tighter off the tee while back 9 are a little bit more forgiving. Greens rolling at a very good speed as a Junior event was being held that morning made it a perfect golf test where sometimes a tee shot would roll for 60-70 yards and into the wind the driver wouldn't go longer than 240yds. There are some great holes out there, specially par 5 7th which played really long into the wind, par 4 10th downwind allowed a big shortcut to the fairway and easier approach to that tough narrow green. Par 3 17th was a hybrid and maybe the toughest hole on the course while 18th played really long and tough, saving one of the best bogeys of the year from that right side rough. The Club House is not the original as the today Lodge used to be it, it is a most modern construction but very well designed and very comfortable for visitors. The final analysis is that Prince's might be not as famous as Royal St George's and maybe a little "less good" than Cinque Ports but all in one it is a great venue, a demanding test and a very nice place to stay. And a MUST PLAY, every devoted golfer seeking to tick Major Venues has to play this one, who long ago hosted the great ones at THE MAJOR. A final line to the Lodge ... as good as you can expect! Food top quality and staff extremely friendly and kind. An unforgettable experience! Congratulations on your accomplishments to date and by no means skip the finish at Musselburgh Old. I would highly recommend making use of the hickory shafted clubs you can rent to savor the full experience of Musselburgh. Both the Shore and Dunes loops are similar in the fact that the opening sequences of holes both head out to the furthest point of the property. Out here the land backs directly onto Royal St. George's but the quality of golf at Prince's means you are not even slightly tempted to jump the fence and sneak a few holes at this prestigious Open Championship venue. (OK, well maybe a little bit, but you get the point). If you start your round on the Shore course and face a head-wind it can feel like an eternity before you reach the second green. The first is a long par four and the second a three-shot par five. However, the exquisite short third, with a wonderful lone bunker protecting the green, provides a momentary breather before you face two more strong holes in the form of par fours with some exceptional bunkering at the former and a fascinating raised green at the latter. Dunes also starts with a demanding hole that arches round to the left and is followed by yet another splendid par three, this time played to a smallish green and protected by three deep bunkers. Fairway bunkering at the long third is the main obstacle although out of bounds can come into play down the right, especially if a strong wind is blowing off the sea. The fourth is one of the hardest on the course whilst the fifth is a true highlight as you play between large bunkers, one of which is sleepered, to an elevated green that has the luxury of a back-drop if required. The inward stretch commences with a brilliantly designed par five. Bunkers must be avoided along the way but it is the long, elevated green on top of a huge dune that makes this hole stand out. And it is followed by yet another majestic par three, possibly the best of the quartet, where the right half of the green should be favoured in order to avoid trouble on the left. The round closes with a 430 yard par four that demands both accuracy and length. 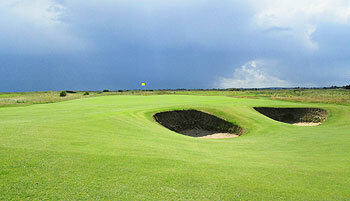 The beauty of Prince's is that it is one of very few links courses that has accommodation on site. There are plenty of inland resort courses with hotels but not many seaside courses can cater for a large group of players away from the course like Prince's can. Here you have it all; 27 holes of top-class links golf, luxury accommodation and award winning dining. There’s no doubt in my mind which is the best 18-hole configuration at Prince’s. I finally got round to playing all 27 holes last Sunday on a gloriously sunny shirt-sleeved day. Only Old Musselburgh now eludes me for the full set of Open Championship venues. Prince’s was absolutely bursting at the seams with golfers last weekend – this is clearly one seriously popular club and quite rightly so. The golfing test on the main two 9-hole loops is brutal, especially in the 3-club southerly wind that we had to do battle with. Unfortunately we played each of the three loops out of sequence. We tackled the Dunes first, followed by the Himalayas and then the Shore. The anti-clockwise Dunes loop was playing directly into the wind for the first five holes, and right from the off our scores reflected the difficulty. The opening hole is a killer par four that played like a par six into the wind. Not one of our group (including a pro) could salvage even a par on this hole. As we turned at #6 with Royal St George’s and the wind at our backs we started to score. The Himalayas was a welcome letdown after the brutality of the Dunes, but this nine felt disconnected and rather awkward with more trees and vegetation flanking the holes. This loop was also a little unloved condition wise but the General Manager later told us that Mackenzie & Ebert has been commissioned to completely remodel the Himalayas. I just hope the Himalayas green complexes don’t change too much as I felt they were really good, a notch better in places than some greens on the Shore and Dunes. My favourite of the three circuits was the Shore, which we played in the late afternoon/early evening. It may be that the shadows were lengthening and the wind had dropped a few notches. I loved this clockwise loop that follows the Channel going out and I really enjoyed the 5th with its green next to the lodge and virtually at the boundary of Royal St George’s. The bunkerless raised greensite is one the best on property and I didn’t realise until after the round that this is one of the original greens and it was the post-war 18th when Gene Sarazen won the Open. 6,600 yards from the yellow tees was more than enough yardage for me and I glanced back at the (7,300-yard) tips on numerous occasions thinking no way, not in this lifetime. It’s a stern test, even from the forward tees. Visit Prince’s to be examined but don’t expect too much drama, just anticipate tragedy, especially if you choose the wrong tees boxes. Prince's is the third best course on this wonderful stretch of Kent coastline but that's purely down to the sheer quality of its two Royal neighbours. I’ve just returned from playing the three nines at Prince’s, having completed a personal mission to play all fourteen Open venues. Reading the club’s excellent book “A Celebration of 100 Years,” I see from an overlaid map that I managed to putt out on more than half the greens that were in play during the Open that Gene Sazazen won in 1932. The layout has been radically altered in the eighty two years since that event took place so it was particularly pleasing to still be able to hole out at the modern 5th on the Shore nine, which was formerly the home hole on the old championship layout (next to the fence that separates the course from Royal St George’s), in front of what are now the new Prince’s Lodge accommodation buildings. The one abiding memory that I’ll take away from this place however is the length of carry required from the regular gents tees! All very well when you’re facing downwind of course but into a strong wind, the 150-yards minimum required on some of the holes to get the ball in play became mentally tiring after a while, to the detriment of my already fragile game. If you’re coming to Prince’s in search of fun golf then forget it; this is a serious championship-standard track that will severely test your handicap. My favourite holes on each nine were all strong par fours (the Shore #6 with its offset tee and angled green, the beautifully cross bunkered #4 on the Dunes nine and the left dog legged #2 on the Himalayas) though, in truth, there wasn’t a single weak hole to be found anywhere on the card that I can remember. I’m now a little surprised to find out the current ranking of Prince’s in the English Top 100 chart – can there really be as many as fifty plus courses better than this one? This 150 yards average carry you described in your review, from which tee is that the case?